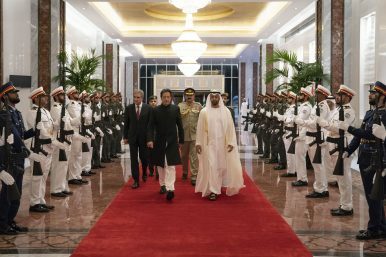 In this photograph by Abu Dhabi's Crown Prince Court released by the state-run Emirates News Agency, Pakistani Prime Minister Imran Khan, left, walks with Abu Dhabi Crown Prince Sheikh Mohammed bin Zayed Al Nahyan after arriving in Abu Dhabi, United Arab Emirates, Wednesday, Sept. 19, 2018. The China-Pakistan Economic Corridor, while a bilateral project, has ample space for additional partners to invest. From the beginning, the China-Pakistan Economic Corridor (CPEC) has been a strictly bilateral project between Pakistan and China. Even though other countries have been invited to join in at various times, control of the project remained with the original partners. According to the contracts, other countries can join CPEC-related projects but the policymaking and implementation is to remain a bilateral arrangement between China and Pakistan. In the past, Pakistan had invited both Iran and the United States to join CPEC as well, so in that sense inviting Saudi Arabia is nothing new. Becoming an important stakeholder in the Pakistani seaport of Gwadar in the province of Balochistan, Saudi Arabia has long-term plans that also carry geopolitical implications for the region as it embarks on this new foreign policy. Unavoidably, some realities about the project are bound to change with the entry of the Saudi Arabia and the United Arab Emirates (UAE). As participants in CPEC projects, each country brings its own geoeconomic targets and national interests into play and there are both pros and cons. First, China’s energy security — requiring nearly one-fourth of annual global energy supplies — depends on these oil-rich countries and it has no choice but to share opportunities arising from Gwadar in the days ahead. But even though China can benefit a lot from the proposed oil pipeline from the Middle East and improved trade and transport facilities, it can easily get dragged into complications caused by the difficult ties between Iran and the Gulf countries in the days ahead. Second, even though China has excellent relations with Saudi Arabia and the UAE, more investors can also reduce China’s sole influence over Gwadar port. As more partners get involved in the development of the seaport, China’s leverage is bound to decrease. On a positive note, Gwadar is going to be promoted as a trade destination by more countries now and this should kill rumors that it might become a Chinese naval base. Sweeping aside the many controversies regarding CPEC, this could turn out to be the beginning of a new phase as the project acquires a more positive image. In fact, the prospect of Saudi investment has already helped divert global attention from the controversy regarding debts incurred by Pakistan, its economic crisis, and the possible connection with ongoing projects with China. Helping to enhance the credibility of CPEC and projecting Gwadar as a stable opportunity for foreign investment, Saudi Arabia’s involvement can greatly enhance the image of the megaproject. Another aspect is that both Saudi Arabia and the UAE become part of China’s Belt and Road Initiative (BRI) by pitching in to invest in Gwadar. According to Beijing, “any type of bilateral cooperation (with China) can be considered part of the Belt and Road.” Working on an “oil city” and oil refinery in Gwadar port, which is the main port of the BRI’s “flagship corridor” CPEC, these Arab countries have automatically become linked to the most focal part of the BRI. And this is only the beginning, as more countries could hop on the bandwagon. Leading by example, Saudi and UAE involvement can encourage more Arab and African countries like Egypt to become involved in projects in Gwadar. Notably, the UAE has already been providing facilities to locals in the port city as it runs the Karachi-Gulf Expresslinking up Abu Dhabi, Jebel Ali, and Sharjah with Gwadar. Investing in logistics, ports, oil and gas infrastructure as well as the construction sector, the UAE is planning to set up an oil refinery worth $5 to $6 billion at Gwadar. In the future, Gwadar promises to become a “base station” for the Middle East as it can speed up the delivery of oil exports and imports across the region with consignments from the Middle East and Africa reaching China over a distance of just 3,400 miles. Adopting a more diverse and balanced role, the addition of more investors in Gwadar is exactly what it needs. Sabena Siddiqui is a foreign affairs journalist and geopolitical analyst with special focus on the Belt and Road Initiative, CPEC and South Asia.